Commissioned by RTE's Pauline McNamara, it is a 6 x 20 minute children's series blending live action, animation (by Ian Kenny) and VFX (Egg Post Production). 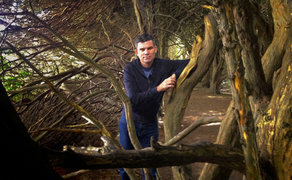 'Bernard Dunne's Mythical Heroes' begins its second run on Monday on RTE 2 at 5.05 and will also be available on the RTE Player. Commissioned by RTE's Pauline McNamara, it is a 6 x 20 minute children's series blending live action, animation (by Ian Kenny) and VFX (Egg Post Production). The show re-tells classic Irish myths in a fast, funny and visually sumptuous way to appeal a new generation of Irish kids aged 8-12. It is supported by BAI's Sound And Vision Fund. It was produced by Firebrand Productions' Mark Warren and directed by Hugh Farley. Presented by former world champion boxer Bernard Dunne, it features Jack Walsh, Sophie-Jo Wasson, Gavin Fullam, Ali Hardiman, Ross Gaynor, Mella Caron and Youseff Quinn. Casting was by Thyrza Ging at Louise Kiely. Writing credits are: Hugh Farley, Mark Warren and Dee Roycroft. Director Of Photography is by Ronan Fox, Costume design by Adelle Hickey, Make-up by Tee Elliot, Production Design by Carolyn Croke. Post production was handled by Egg where Malcolm Maloney cut the show. Nik Panteris was the colourist. The show will transmit Monday, Wednesday and Friday for two weeks commencing on Monday 3rd December.